Rainbow Party Presidential candidate Wynter Kabimba has promised to improve the working conditions for workers in the tourism industry. Mr. Kabimba says the Rainbow Party is saddened by the exploitation of workers by investors in the tourism industry. He says under the Rainbow Party leadership, no investor will be allowed to exploit workers by paying what he terms as slave wages. And Mr. Kabimba has also says once voted into office, the Rainbow Party will give bursaries to all eligible Zambians in colleges and universities. He has also promised that the Rainbow Party will tackle corruption and equitably distribute development to all the ten provinces of Zambia. 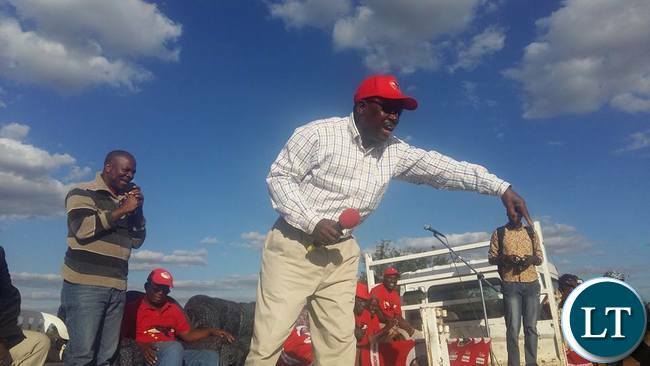 Mr. Kabimba said this in Livingstone when he addressed two political rallies in Maramba and Dambwa Site and Service, where he also introduced Rainbow Party candidates in Livingstone to the electorates. President Lungu promises to revive rice industry in Western Province. I work in the tourism industry and get much better salary from a foreign investor because they are always being checked by immigration and labour, where my friends they work for zambians and get poor wages and sometime not paid for several months and if they go to labour nothing happens as the zambian employer is protected. so this Kabimba man knows nothing. But you said the employer is protected by the labour laws.so both u and kabimba are saying the same but maybe u hav a higher position;which investors ar using as a scapegoart by paying u good but wht about ur workmates. Yes, Kabimba needs to work extra hard, if he was humble today he could have been president. He was to pompous that Sata fired him, and ended with no choice but to leave instruments of power to a drunk Edgar. MR KABIMBA, YOU ARE ONE OF THE CAUSERS OF THE CHALLENGES THAT ZAMBIA IS ACING NOW. This Wynter Kamimba is a joke of a politician. He failed lamentably when he was SG for PF. The best he did was to destroy anyone appearing to be presidential material. No wonder he was fired by Sata. Rainbow Party in bright red? Winter cant even get colour coordination right! In fact in majority cases in majority progressive countries. Rainbow is used to denote diversity. Not just for the love of rainbow. Therefore groups such as gay groups tend to use the name or terminology to show that they embrace all strands of the community. You can imagine how the name of this party misled me when I first came across it in Zambia. Kabimba failed to protect his own job and you believe he can protect yours? Get him into State house and that will be all. The others, after being given the power, sold houses to tenants and you thought they were doing you a service but instead they did themselves greater service by fattening their accounts. Where is the money from the sales of all entities? Ow please Kabimba! You know what the deal is with those licence tenders. You know very well what was happening when Masebo was minister and what she tried to stop. It’s all about the cash cow when it comes to tourism in Zambia and people wanting to get rich instead of enriching the industry. Please you have no idea about the industry and have no right to try to preach as if you care when you want to line your pockets. Failed man please stay out of politics. You are a finished product who many don’t seem to care about. Just disappear into oblivion!